Version 2.1.0: Upload to Dropbox becomes much easier. We are glad to announce that Hi-Q MP3 Voice Recorder version 2.1.0 has been released! One major improvement that we want to highlight is the ability of Dropbox auto-upload. 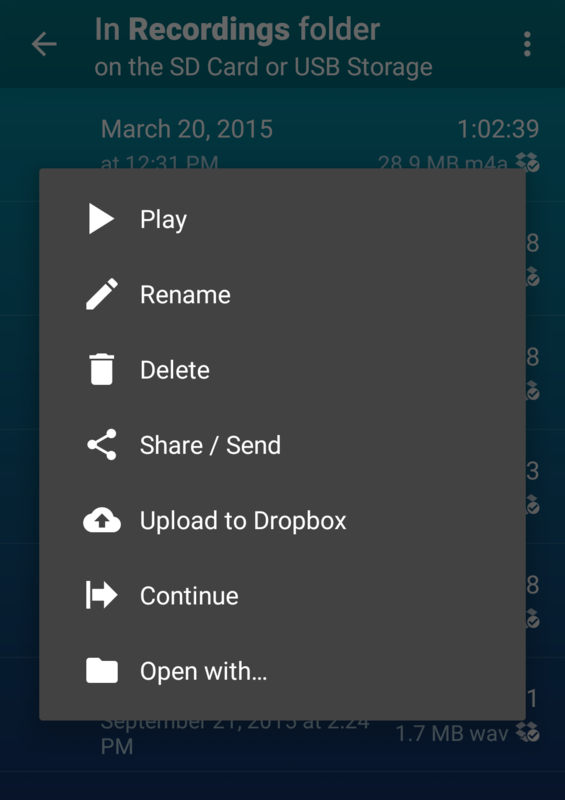 Now you may already know that you can share your recordings to Dropbox from the share menu. But there is no way to automatically do it every time you create a recording. With this new auto-upload ability, you don’t need to worry if some time later you lose your phone or the storage media fails, because you will have a backup of your recordings in Dropbox! It also means that you can get rid of chunks of bulky recordings in your phone and free up the device storage because Hi-Q MP3 Voice Recorder will indicate which recordings have been safely uploaded. Open Hi-Q MP3 Voice Recorder and go to settings > Dropbox. First you will need to log in to your Dropbox account to activate the feature. After that you can always toggle on/off or totally log off from your account by tapping the “Account” entry. After you log in, a folder will automatically be created at Dropbox > Apps > Hi-Q Recordings and all the uploaded recordings will be stored there. 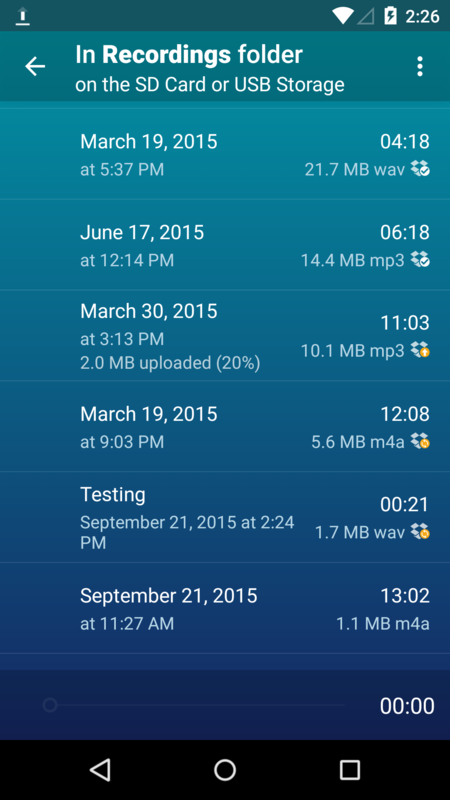 With the “upload new recordings” option turned on, the app will automatically upload new recordings to Dropbox. Choose to upload whenever there is wi-fi and mobile network or via wi-fi only to conserve your mobile data usage. You can also check the Status to see how many uploads are pending or in progress, or whether it is idle. In the recording list, you can see little Dropbox icons indicating whether the recordings are “uploaded”, “currently uploading”, “pending upload”, or “error”. Errors may happen when connection is lost in the middle of uploading (it will automatically retry) or when the Hi-Q Recordings folder in your Dropbox is missing. 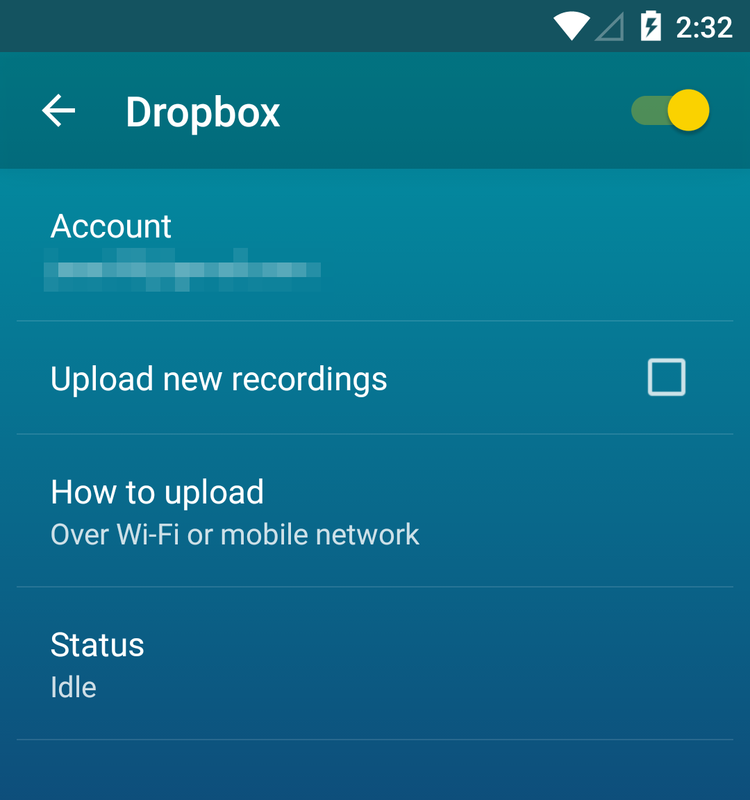 You can also upload your existing recordings to Dropbox by tapping them and choose “Upload to Dropbox”. Please note that this is not a Dropbox two-way synchronisation. After the app finishes uploading the recordings, you can edit/rename/delete the files in your Dropbox and Hi-Q MP3 Voice Recorder will not do anything about them. 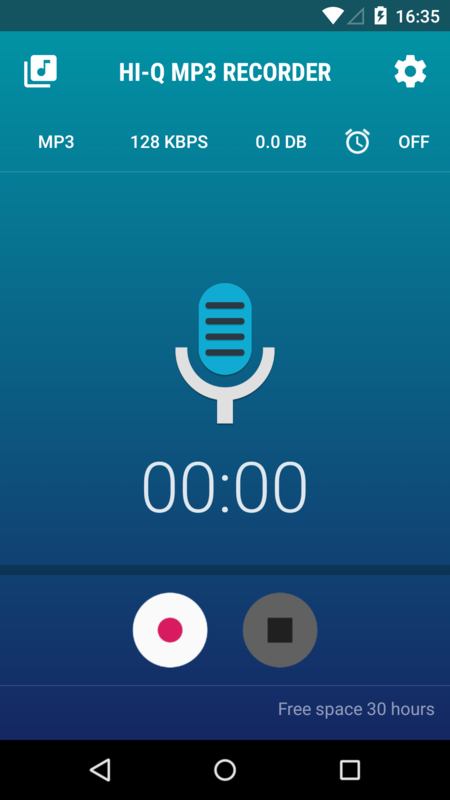 On the latest update of Hi-Q MP3 Voice Recorder, we introduced new UI element in the recording page that we called “Quick settings”. We thank for your feedbacks, as this feature has been suggested by some of you and we think this is going to be very useful for recording. The Quick settings gives you ability to modify the recording directly in the recording page even while the recording is ongoing. Choose which recording format (MP3/WAV/M4A/OGG/FLAC). You can’t change the format while recording. Set the recording quality. Note that WAV and FLAC don’t have this option. You can’t change the quality while recording is ongoing. Adjust recording gain. The best part is you are able to adjust gain while recording. So if recording is too loud or too soft, you can easily change gain and adjust it directly in the same screen. Note that if you adjust gain while recording, you are adjusting the “current recording gain” which is specifically for that recording, meaning the gain setting will not be saved for the next recording. Meanwhile, adjusting gain while you are not in recording session will change the “default gain”. Add timer and the app will automatically stop the recording after the specified time. You can adjust the timer even while recording is already ongoing. Note that timer option is only in Quick setting. If you haven’t update the app, you can update the app through Google Play. We hope this feature will be useful for you.